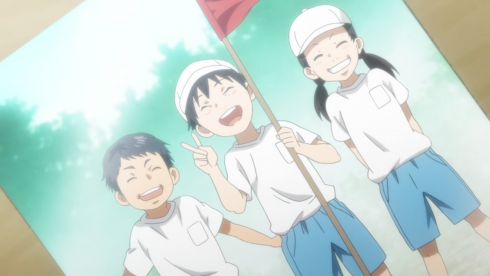 After spinning its wheels and rushing its art last week, I’m relieved to say that orange‘s production schedule and story both seem to be back on track (pun very much intended). The relay race is here at last, and with it the kids find time to directly address their own feelings and one another’s. 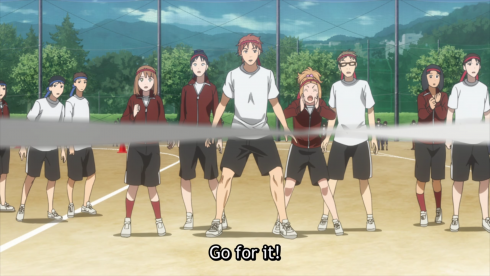 As with most orange episodes, the plot is pretty easy to summarize: The gang competes in the relay race at the athletics festival, and through supporting and encouraging each other they’re able to spur the team (and Kakeru in particular) on to victory. On the romance front, Naho suggests a headband swap (oo, an indirect headbutt! 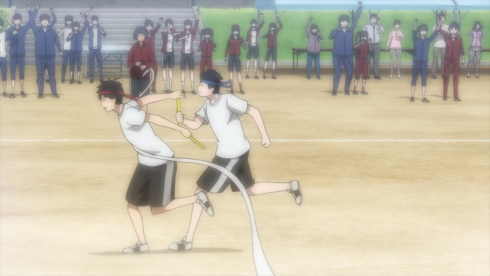 ), Kakeru steals a peck on the cheek, and Azu and Hagita may be going out now? 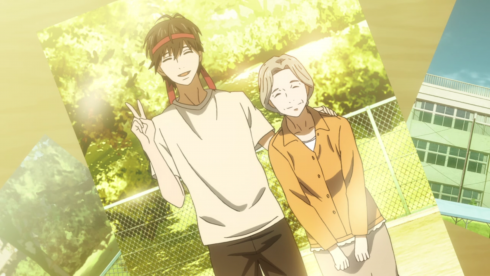 Although, really, the focus this week is very much on friendship, as Kakeru opens up to the rest of the gang and they all grow a little closer because of it. The group chat about Kakeru’s struggles is about as straightforward as it gets, so there’s not a whole lot for me to add to it other than to say it’s refreshing to see a series so directly address its character’s emotional troubles. As a culture, Japan tends to embody the general mentality Naho had in the early episodes: That it’s better to “bear it” than bother anyone else with your problems. Although, really, most societies need to learn to handle negative emotions (and especially mental illness) with more empathy and openness, so it’s good to see orange aggressively challenging the culture of silence and showing how much healthier it is to talk to others. Every time Kakeru opens up to another person and they (1) listen, (2) continue to love him, and (3) assure him it’s okay for him to be happy, the weight of his guilt grows just that tiny bit lighter. As a part of the show’s central push for people to talk to each other when they’re hurting, it struck me this week that orange is mighty fond of using injuries as a shorthand for emotional pain. 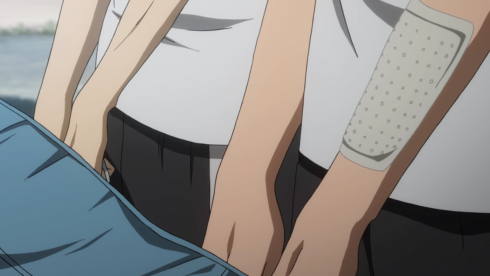 Naho and Kakeru frequently bond over twisted ankles and scraped arms, and the act of tending to another’s external ailments goes hand-in-hand with listening to their internal ones. It’s a smart way to draw parallels between physical and emotional pain; to show their similarities and make the case that people should seek help for both. Many of us live in a society where we’re encouraged to tell someone if our ankle hurts, but discouraged (implicitly if not explicitly) to do the same about, say, depression. By constantly tying physical pain to emotional pain, orange urges its audience to tear down many of the false distinctions between them, and to understand that neither should be bottled up or ignored. Both require treatment. Importantly, it also shows how getting an ankle bandaged doesn’t automatically make it better. 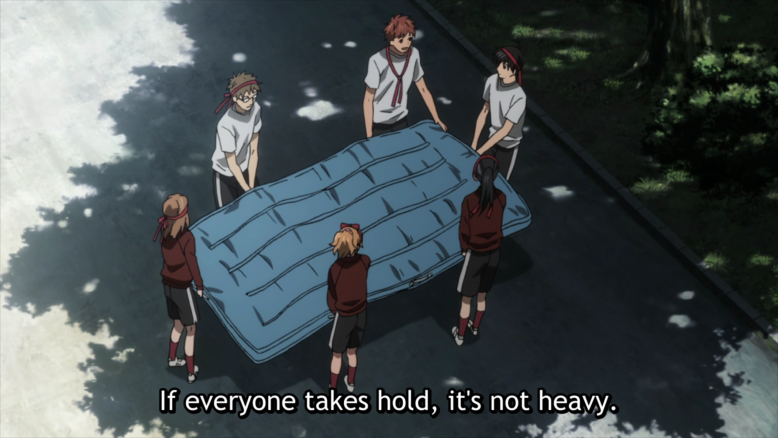 Kakeru can run on it, but it‘s still injured. Complete healing takes time. That’s true of grief, too. 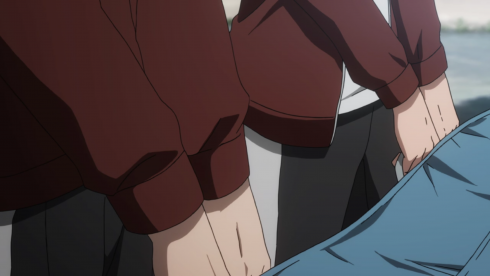 There’s also a point of potential concern here, I think: The gang sends Kakeru to the first-aid tent so someone with the proper training can check on his ankle, but no one ever suggests he see a counselor about his struggles with depression. I don’t remember if the series ever addresses this, so it’s no spoiler to say that I hope it does, otherwise our physical/emotional parallel will have an unfortunate flaw in it. Even so, orange is tackling the subject better than most series ever do, so even with that potential issue, I’m still impressed with its focus and message. The value of having a supportive community aside, there are two other less obvious but important points that come out of this episode. 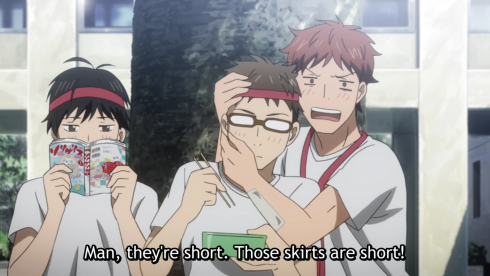 One is an on-the-nose line of dialogue that is nevertheless the kind of thing we need more often in fiction: When the gang is encouraging Kakeru to have fun at the athletics festival, Suwa also makes it clear that it’s okay for Kakeru to not have fun, too. “We don’t mean to force you to smile when you’re hurting,” he says. “But when you’re actually having a good time, it’s okay to smile.” That one-two punch of honesty and self-forgiveness is orange in a nutshell, and the kind of thing any of us who have struggled or know someone struggling with grief or guilt should probably have cross-stitched into a pillow or two. The other point is more subtle, but almost as inspiring as the gang’s “telephone” message to Kakeru (‘scuse me, I have some dust in my eye just remembering that scene…), and that’s the conversation Kakeru and his grandmother have. 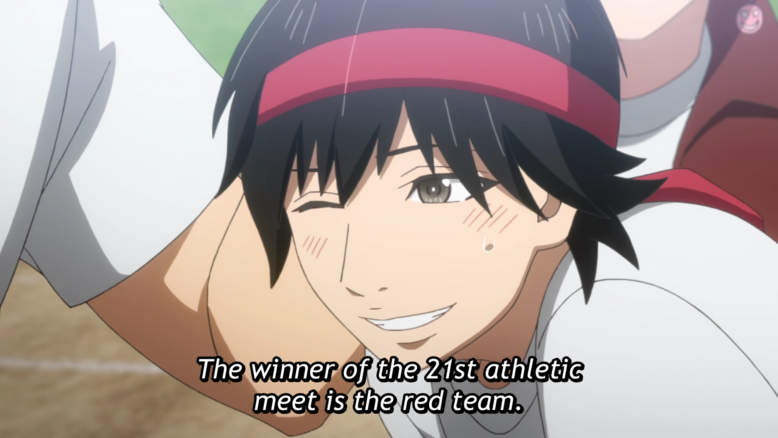 She recalls another athletics festival in preschool, after Kakeru’s parents had divorced. He was upset during that one, too, but finally smiled after his team won the relay race. It’s an echo that serves to highlight the inevitable crests and valleys of life. 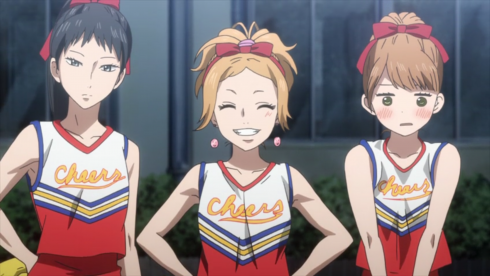 This isn’t the first time it’s seemed impossible for Kakeru to smile, and it likely won’t be the last. But the smile will come again, eventually, if he’s willing to keep moving (racing?) forward, with the people who love him cheering him from behind and ahead–and along the sidelines, too. In the end, the letter tells Naho to make it a day where Kakeru doesn’t “feel like crying,” and she fails at that. But the tears Kakeru sheds are more of relief than regret; of letting go, at least for now, of the feeling that he “doesn’t deserve happiness.” Sometimes people need to cry those kinds of tears, and Naho understands that. The letter was only one possibility among hundreds. That’s how the future works. And, slowly, by both acknowledging the letter’s “past” and making choices based on their own present, Naho and her friends are shaping their future into a different one–and, hopefully, a brighter one, too. As a fun(?) aside, the culture in the U.S. Midwest is somewhat similar to Japan, where politeness is often valued over honesty and conflict is discouraged in favor of community harmony (even if it is a charade). As a result, I’ve had Japanese teachers say they find the culture shock much less dramatic here than they do on the coasts. As with many cultural mores, there are both positives and negatives to that, I s’pose. 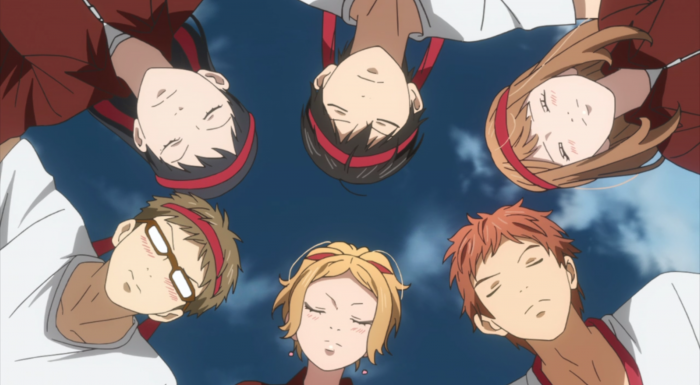 Between orange and Chihayafuru, I’m starting to think that swapping headbands is a not-uncommon romantic gesture, but I’ve never heard of it and a quick Google search yielded zilch, so don’t quote me on that. Any readers in the know are welcome to chime in below.